Nobody calls it Mount Caramel, even though that’s the technical name for the tree-covered hills that slope up off the Hamden, Connecticut landscape. When you look at it from flat ground a few miles away, the mountain, or what passes for a mountain in southern Connecticut, looks like a person, lying on its back. So, it’s called Sleeping Giant. And it kind of always has been. According to Quinnipiac Indians legend, the mountain is the giant Hobbomock, put to sleep from a spell cast by the good spirit Keitan. The majority of the giant is protected within Sleeping Giant State Park. The terrain winds with hiking and horseback trails, and is dotted throughout with campsites, small ponds, and quarries. The Sleeping Giant Park Association map is helpfully labeled with anatomical landmarks: left hip, right knee, and chin. But it isn’t just a giant game of “Operation,” the park is also home to diverse microclimates — small pockets with different conditions from the surrounding area. Sleeping Giant formed about 250 million years ago as part of the Metacomet Ridge, which runs from the Long Island Sound up nearly to Vermont and was created by volcanic explosions that laid down layers of basalt bedrock. Erosion, followed by geological uplift that cracked through the bedrock, formed the craggy cliffs and mountain faces that mark the ridge today and created the topography to support the diverse microclimates. 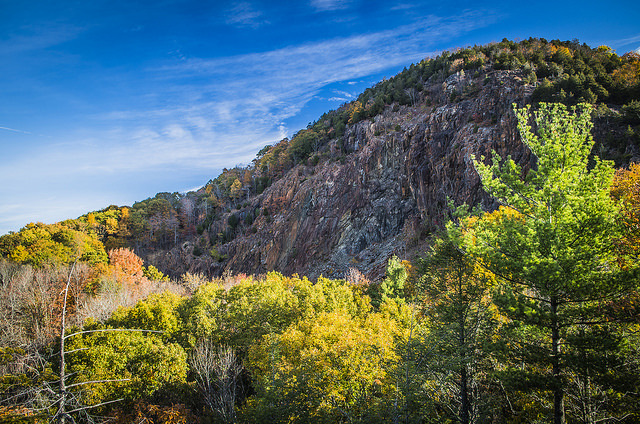 The array of microclimates on Sleeping Giant are also found at other points on the ridge in Connecticut, like the Hanging Hills in Meriden and Totoket Mountain in Guilford, both of which happen to be other great places to hike in the state. The microclimates are not especially unique, says Farnsworth, but their particular location makes them special. That’s why in 2009, then-President Barack Obama established the New England National Scenic Trail, which includes the Metacomet Ridge. “It strings together these conservation areas where people can get out and explore,” Farnsworth says. So if you’re passing through Connecticut, especially when the leaves are changing, hiking through a part of the Metacomet Ridge isn’t a bad way to spend an afternoon. The view off the top of the Sleeping Giant’s left hip is pretty spectacular. Nicole Wetsman graduated from Bowdoin College with a major in neuroscience. Her work has also appeared at New Scientist, Stat News, Science Friday and others. Find her tweeting @NicoleWetsman, mostly about brains and women’s soccer. You can follow Nicole on Twitter here.